A quadruple-double is recorded when a player has double figures in 4 out of the following 5 categories in a game: points, rebounds, assists, steals and blocked shots. To date only five NBA players have officially recorded a quadruple-double in a game. The NBA did not start counting blocked shots and steals until the 1973-74 season. So a number of other players probably did have quadruple-doubles prior to that season. Jerry West claims he recorded a quadruple-double in game in which he scored 44 points, had 12 rebounds, 12 assists and 10 blocked shots. In a 1967 playoff game against the Boston Celtics it's believed that Wilt Chamberlain had 32 rebounds, 24 points, 13 assists and 12 blocked shots. Wilt had 78 triple-doubles during the regular season in his career and the all time leader in the category is Oscar Robertson with 181. So it's not hard to believe that they both probably had either 10 blocks or 10 steals in one or more of those games. At least 7 players since 1973-74 have missed a quadruple-double by just one assist or one steal. All 7 players had triple-doubles and then recorded a 9 in either assists or steals. One of the players is Michael Ray Richardson who was playing for my team the New Jersey Nets on October 30, 1985 when he had 38 points, 11 rebounds, 11 assists and 9 steals in a triple OT game vs the Indiana Pacers. I remember the game because Michael Ray set a new career-high with 38 points and he scored 16 of them in the OT's as he willed the Nets to a 147-138 win. Two more players stand out by just missing quadruple-doubles. On February 18, 1985 Larry Bird had 30 points, 12 rebounds, 10 assists and 9 steals at the end of the 3rd quarter. He refused to go back into the game in the 4th quarter because the Boston Celtics were blowing out the Utah Jazz. On March 3, 1990 Hakeem Olajuwon of the Houston Rockets had 29 points, 18 rebounds, 11 blocks and 10 assists officially in a game vs the Golden State Warriors. But after the game the NBA reviewed the tape and determined Olajuwon really only had 9 assists. They never changed the official tally of 10 assists but refused to recognize the quadruple-double. On January 26, 2018, LeBron James of the Cleveland Cavaliers had a dubious quadruple-double. LeBron had 26 points, 11 assists, 10 rebounds and 11 turnovers vs the Indiana Pacers in a game the Cavs won, 115-108. It's a dubious quadruple-double but it still counts. 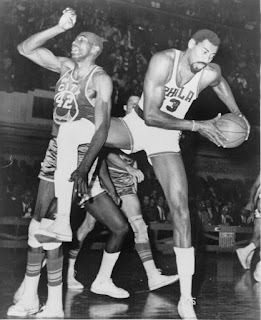 On October 18, 1974 Nate Thurmond (pictured above with Wilt Chamberlain) of the Chicago Bulls had 22 points, 14 rebounds, 13 assists and 12 blocks vs the Atlanta Hawks in a OT game the Bulls won 120-115. On February 18, 1986 Alvin Robertson of the San Antonio Spurs had 20 points, 11 rebounds, 10 assists and 10 steals in a 120-114 win over the Phoenix Suns. Robertson is the only player to accomplish a quadruple-double by having double figures in steals instead of blocked shots. On March 29, 1990 just 26 days after the NBA ruled Olajuwon did not record a quadruple-double in a game he came back and accomplished the feat for real in a 120-94 win over the Milwaukee Bucks. Hakeem had 18 points, 16 rebounds, 11 blocks and 10 assists in the game. On February 17, 1994 David Robinson of the San Antonio Spurs had 34 points, 10 rebounds, 10 assists and 10 blocked shots in a 115-96 win over the Detroit Pistons to record the 4th official quadruple-double in NBA history.